By introducing current debates in the field of critical thinking and posing new questions from contributing scholars, Critical Thinking and Learning examines the received wisdom in the field of critical thinking and learning. Mark Mason is Associate Professor in Philosophy and Educational Studies in the Faculty of Education at the University of Hong Kong, where he is also Director of the Comparative Education Research Centre (CERC). He is the co-author of a variety of articles and books in the field, most recently Changing Education: Leadership, Innovation and Development in a Globalizing Asia Pacific. Foreword (Michael A. Peters, University of Illinois, Urbana-Champaign). 1. 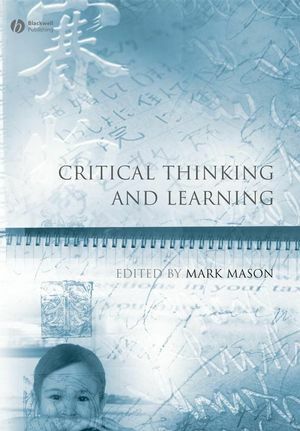 Critical Thinking and Learning (Mark Mason, University of Hong Kong). 2. Kinds of Thinking, Styles of Reasoning (Michael A. Peters, University of Illinois, Urbana-Champaign). 3. Culture, Cognitive Pluralism and Rationality (Colin Evers, University of Hong Kong). 4. Is there a Geography of Thought for East-West Differences? Why or Why Not? (Ho Mun Chan, City University of Hong Kong and Hektor K. T. Yan, City University of Hong Kong). 5. False Dichotomy? 'Western' and 'Eastern' Concepts of Scholarship and Learning (Janette Ryan, Monash University and Kam Louie, University of Hong Kong). 6. Learning, Empowerment and Judgement (Michael Luntley, University of Warwick). 7. Is Popper's Falsificationist Heuristic a Helpful Resource for Developing Critical Thinking? (Chi-Ming Lam, University of Hong Kong). 8. Critical Thinking as a Source of Respect for Persons: A Critique (Christine Doddington, University of Cambridge). 9. Re-Conceptualizing Critical Thinking for Moral Education in Culturally Plural Societies (Duck-Joo Kwak, Konkuk University).